Don't you want to go for a ride? 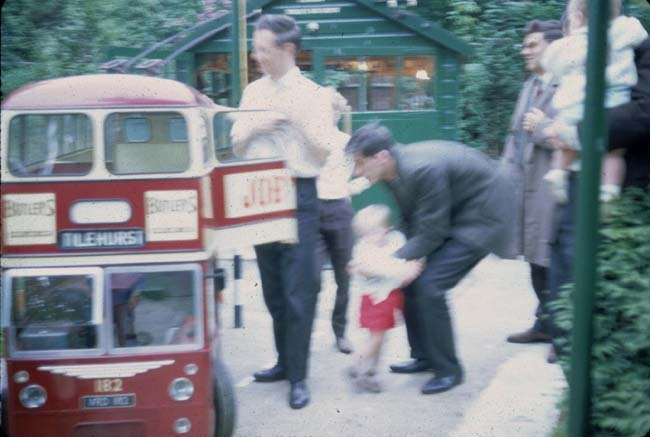 In the late the 1960s in a garden at Great Bookham [Surrey] there was, and still maybe, a third scale drivable model trolleybus which could carry small passengers. The power supply was drawn from the overhead wires at 100V DC, to feed what was at one time the motors on the chassis of an old milk float. Even more remarkable was this working trolleybus attended many local, and not so local, fetes to give rides in much the same way as the appearance of passenger carrying model steam engines with carriages. Caught by the camera is Ken Thorpe and your Webmaster with young son. This model system is described in full on pages 74/75 of the 1967 Ian Allan book "British Trolleybuses" by Symons and Creswell with a photograph of the trolleybus on page 35. My name's Tony Hills and a work colleague was recently sourcing a bus for his wedding. Knowing I was interested in all things mechanical, he showed me a picture of a pre-war bus that could be hired, and I reminisced to him about the time I drove such a bus in the Dorking area. I was able to do so because I knew a chap called Lepine-Smith who ran a miniature trolleybus in his garden and owned a Guy double decker. His company was the Maypine Trolleybus and out of curiosity I put this in a 'Google' search. To my amazement a website appeared with the very trolleybus I travelled in! There is a link to you and you asked for any information. Well, I have two colour photographs of reasonable quality of the trolleybus, one with Lepine-Smith actually driving and looking through the top deck right front window! Did you ever find out if the track circuit still exists in Great Bookham? I would love to know. He got fed up with the model trolleybus and looked for something else to do. He thought a third scale underground would fit the bill, but he couldn't get planning permission from Leatherhead UDC. His neighbours found out and worried every time he went out to do a bit of gardening! How interesting to find this site. I used to work for Peter as a Radio and TV engineer at his Maypine TV shop at Brighton Road, Surbiton in the early to mid sixties. At that time I was interested in other things like girls. I can recall many interesting happenings that I can share with you if you're interested. I notice that you say there could still be at Bookham, so that tells me that there is no contact with Peter, I wonder if he is still alive? I remember Peter and the Maypine Trolleybus Company well. The Reading Trolleybus model was built on a Job's Dairies milk float chassis and ran round his garden. Peter used to drive the NTA tours when we took @foreign@ vehicles to various systems and also regularly on Bournemouth tours. The MTC had various towing contracts for moving trolleybuses around. We towed the Reading vehicles to Tees-side [in mid winter!] using the converted Scammel tractor unit GGU264 which was owned by some members, including I think Paul Sutherland, then NTA Chairman. There were I think about three other owners. The weather that winter was appalling. I remember towing one trolleybus up the M1 in the middle of the night and it was snowing so hard that it was almost impossible to tell which carriageway we were in - and no cab heating either! I left Reading late evening with a red and cream trolleybus and arrived at Cargo Fleet depot late the following afternoon with a completely white one. The snow after we left the A1 was up to the lower-deck windows. Another job was the delivery of Bournemouth 301 to Walsall for Edgeley-Cox to see if they were worth buying. Low railway bridges were a hazard marked on maps but not the footbridge linking two parts of an army training establishment somewhere near Westbury! A tricky reversal and miles of diversion through narrow country lanes gave other motorists something to think about. I think that someone told me fairly recently that Peter was still around, although the garden system was dismantled and the vehicle in store. Paul Sutherland is also still around I think - Andrew Braddock might know more. Alternatively, Mike Russell who still works for Reading Transport might have some news. Peter Lepine-Smith is certainly still around [he re-named himself Peter Lepino] as I dealt with an order for the Nottingham book the other day wearing my "Trolleybooks" hat. Paul Sutherland is still around, too - I think he may be working in the Operations Department of London Buses or has perhaps, by now, retired. I well remember the towing of the Reading trolleys to Teeside as it was then the case that coach drivers and their guests got free meals in Motorway Service Areas pro-rata to the number of passengers carried. The staff were always surprised when told "72-seater" in place of the more common "53" or "45"! The towing crews never went hungry. I understand from John Whitehead that Peter Lepine-Smith still resides at his old address [which I don't know] in Great Bookham. I understand the 1/3 scale Reading trolleybus has recently been refurbished. A picture taken in June 1984 at the home of the operator Peter Lepine-Smith. It is a great shame that this could not have been transferred to somewhere like Sandtoft. At one time Peter had articles on the systems in many newspapers and magazines as well as TV slots. It carried three passengers in addition to the driver and was constructed from a Jobs milk float. Peter L-S drove trolleybuses on many tours towards the end of the provincial systems. The miniature Maypine trolleybus system still exists. It was dormant for many years, but during the last couple of years or so it has been resuscitated and apparently it occasionally still operates. Attempts were made three or four years ago to secure the vehicle for Sandtoft but the overtures were rebuffed as Mr Lepine-Smith wished to retain and rejuvenate it. Do you know what the current status of the Maypine Trolleybus Company is? I remember seeing it working as a boy and still often look over the fence [I'm now 40] in the hope of seeing something working! Yes, I'm still around, though now retired from London Transport after 47 years in the bus industry. I gained my Trolley Vehicle driver's licence at Teeside in about 1970. In June 2011 I visited the Bradford Industrial Museum for the Centenary of the first British trolleybus operation in Bradford and Leeds simultaneously. There I met Stanley King, the Bradford City Alderman who chaired the Transport Committee in its heyday. He recalled that I had ridden on Bradford's last trolleybus, as he had, in March 1972. I bet the taxpayers of Edinburgh are now wishing they had opted for trolleybuses! Well how about that. I was just sitting having a glass of wine looking out across the Carrick Roads, [up the estuary from Falmouth] when I thought I wonder if Peter's trolleybus is around so I googled it! I have no idea at all why I thought about it. I have often told friends about Peter's eccentric schemes - of which he had many! I used to work at Peter's Radio & TV Shop, 'Maypine' as a Saturday job, being about 15/16 at the time in 1958. I remember the antics well. Peter drove a Wolsley 110, black, with a VHF 2-way radio antenna in the middle of the roof, funnily enough other motorists thought it was an unmarked police car. We had one session where the shop VHF set was put in the car, both vans had mobile VHF sets, a Ford 8 and Ford 10 [the brakes were non existent!]. 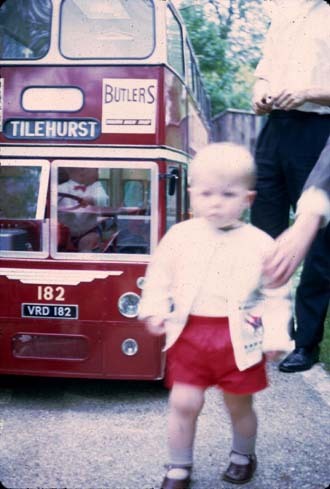 We went to Morden, I think or wherever the last Trolleybus service was ending in a celebration, we had to run out with a mic attached to a tape recorder and interview the gathered "crowds" - what a laugh this was. When I could drive I used to go out in one of the vans servicing or fitting TV aerials, but couldn't stop! I bought an MG Midget off Peter in 1963, and then his MGB in 1966 and I suppose lost touch after that. We are retired and live in Cornwall. We ran an electronics company in Tewkesbury for almost 30 years which I started in 1972. So there is my potted history. Only a side issue, but at top of page, Tony Hills mentions Peter Lepine-Smith owning a Guy double-decker. For the record, the bus still exists. It was a 1942 Guy Arab I, originally with a Weymann austerity body, later rebuilt by Reading & Co., Portsmouth. It was operated by Provincial of Gosport and is now preserved. Here is a brief history and some photos: www.provincialsociety.org/survivors/eho228.htm.